Disclosure: I received a free bottle of Kohana Cold Brew Coffee Concentrate to use to create a recipe for their recipe contest. I’m a big coffee lover. I love coffee so much, in fact, that I regularly guzzle three or even four cups of decaf a day because I enjoy the flavor. But, I don’t use coffee in recipes very often, or at all. So, when I heard about the recipe contest that Kohana Coffee was hosting, I was excited to get to play around with their cold brew coffee concentrate. 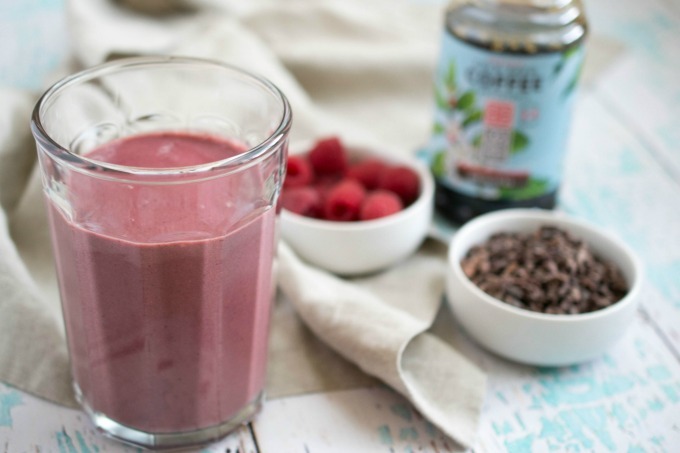 That’s how this Raspberry Mocha Protein Smoothie was born. As the mom of an infant, I need recipes that are quick and easy. If I can eat it one-handed, that’s a huge bonus. Naturally, I wanted to figure out a way to incorporate coffee into a smoothie. 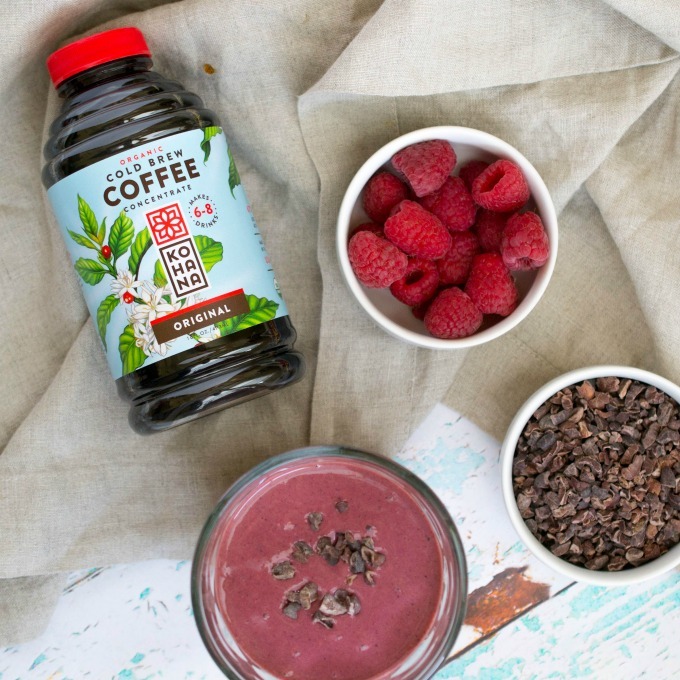 Who doesn’t love a way to stay caffeinated, get in some protein, and get in lots of antioxidants and vitamins, too? 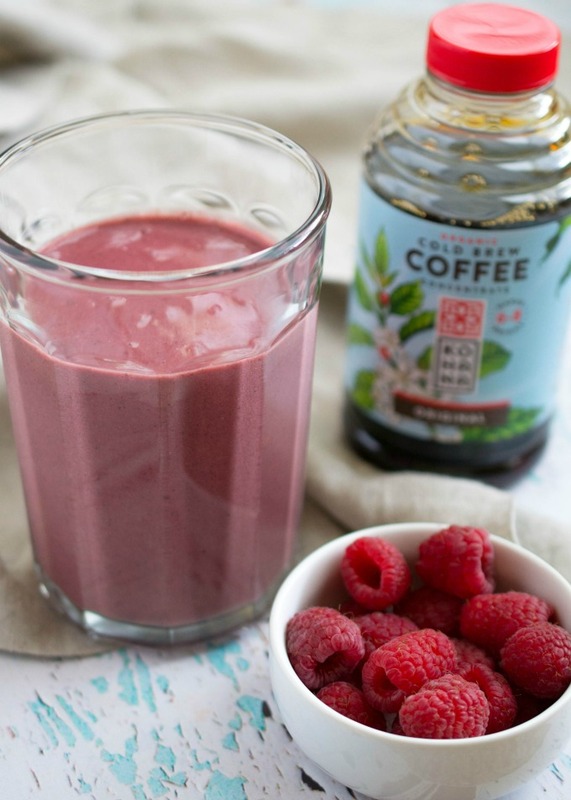 This #vegan Raspberry Mocha Protein Smoothie will wake you up + get you TONS of antioxidants! Watching your sugar intake? If you choose your protein powder carefully (I used Vega in mine), you can make a smoothie without any added sugar. I will say that this smoothie isn’t very sweet naturally, so you may want to add in a few drops of liquid stevia or a packet of stevia crystals. « What is Mindful Movement?